Back in the thick heat of July, on World Cup Final weekend in fact, I made my way north across the county line and into Somerset. I snuck through Yeovil, dropped down onto the Levels and listen to the tyres crackle across the dust and loose stone of a well-worn track. Windows down, skin brown and yellowhammers singing from the top of the hedgerow. I timed my Ashmead arrival rather perfectly. Garrett swung open the gate before I even reached it, and along the bank Matt Minter had just landed a brute of a carp. Introductions and reintroductions were made as Matt cradled his prize and cameras clicked. The first and biggest carp of the trip. The heat had made the fishing tricky, although the carp were typically conspicuous. Bubbles, bulges in the weed and now and again the brief glimpse of a submarine sized flank. I wasn’t there for the carp, although the invitation had been made. Instead, I was there for an evening to enjoy the atmosphere and Ed Whitby’s barbequing prowess. Of course, I had brought a rod, but chased shapes smaller than the carp. The rudd were voracious, the perch resplendent and joy of joys, I caught my first Ashmead tench. There was a lovely mix of smiles and far more time was spent chatting and chinking glasses than actually fishing. Among the crowd was Martin Herrington, whose face I knew from social media and the occasional email exchange, but who I had not previously met. I knew he and I would get on, and so it proved. We chatted at length and shared many similar philosophies on life as well as fishing. Then, a fortnight or so later, a distinctively shaped parcel arrived. Martin and I had chatted about his net-building, and I had mentioned the fact that my own landing net (a mass-produced number) had been patched up with string after a 20lb+ carp had interrupted a tench fishing session. And now, thanks to Martin, I had my own personalised replacement. I was suitably gob-smacked, but also realised that I needed to christen it as soon as possible. It is the perfect size for tench fishing, so I took it with me on my next trip. 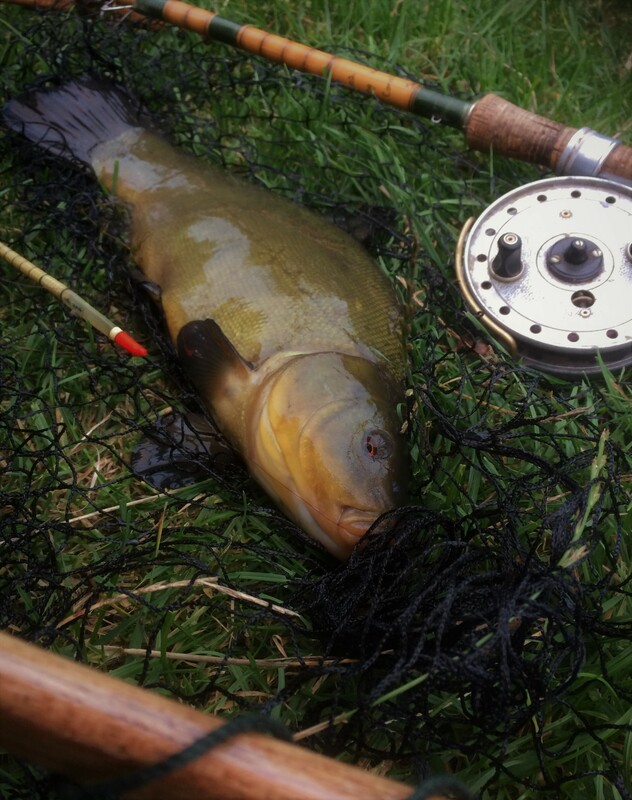 Having left the lake alone through the heatwave, I had returned the previous week and found the tench up in the shallows and in hungry mood – catching a dozen fish up to 5 and a quarter pounds. Unsurprisingly, I headed to the same swim on my return, but the fish were not as quick to respond. I am always wary of overfeeding in this lake due to the head of carp. Too much activity will likely attract unwanted interest, and although they are lovely fish, in the weedy, well-oxygenated water the carp take some landing. Conversely, the hordes of small (and not so small) rudd can mop up a ball of groundbait before it finds the bottom, and unless the tench are bubbling, I am always in something of a quandary as to what to do next. The dimpling of rudd prompted me to up the level of feed, and after an hour or so, the first few bubbles betrayed the presence of tench. A couple of small dips of the float, probably caused by fish busy around the bait, followed, before finally it slipped out of sight. The resistance was moderate, and a splashy little 12-ounce tench did not seem worthy of wetting my new net for, so I drew it in and nicked out the hook without touching the fish. The bubbling began to intensify as a couple of better fish got busy. I unwittingly struck at a line bite, an oval scale pricked onto the point of the hook, before making contact once more. It was a bigger fish, and one that seemed wholly appropriate to dip the net for. I took a couple of quick pictures and fished on. I like to regularly feed small, walnut-sized balls of groundbait to keep the bait concentrated and avoid the splash which might draw nuisance fish, but a couple of wayward throws, followed by an impatient over-adjustment, spread my baited area. If the tench are feeding well, it doesn’t matter too much. They will eat through the peripheral areas and still find my hook bait (a lump of magic paste). Unfortunately, however, there only seemed to be odd fish in the area, drifting in for a brief graze, before drifting off again. As I waited for another bite, my mind wandered back to last season, and that net-destroying carp. 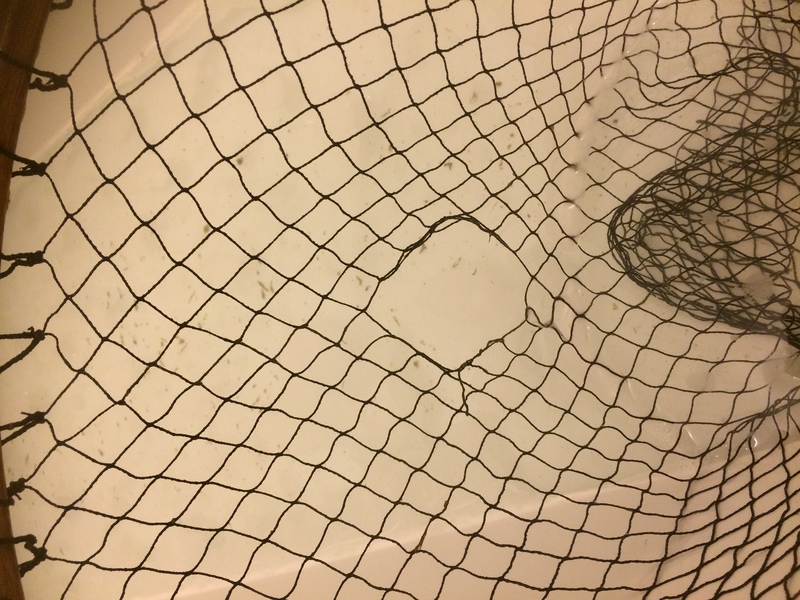 Thank goodness, I thought, that I didn’t have to land it in my spanking new Herrington net. That could have been disastrous…..
And then came an uncomfortable nagging feeling. Had I tempted fate? I caught that carp at the opposite end of the lake last year, but what if…? I tried to shake it, but the sense continued to manifest. It was daft, surely, and yet…Then I remembered my old net was still in the boot of the car. I reeled in and reached for the car keys. The brisk walk allowed rationality to return, and before I reached the car I scolded myself for being daft and left the old net where it was buried. Sometimes though, it is wise to listen to the voices in your head. The bite came within a minute of recasting, and I knew immediately what I had hooked. I apologised to my rod (having promised it last year that I wouldn’t put it through such an ordeal again) and began the tug of war. I was confident of landing it again. 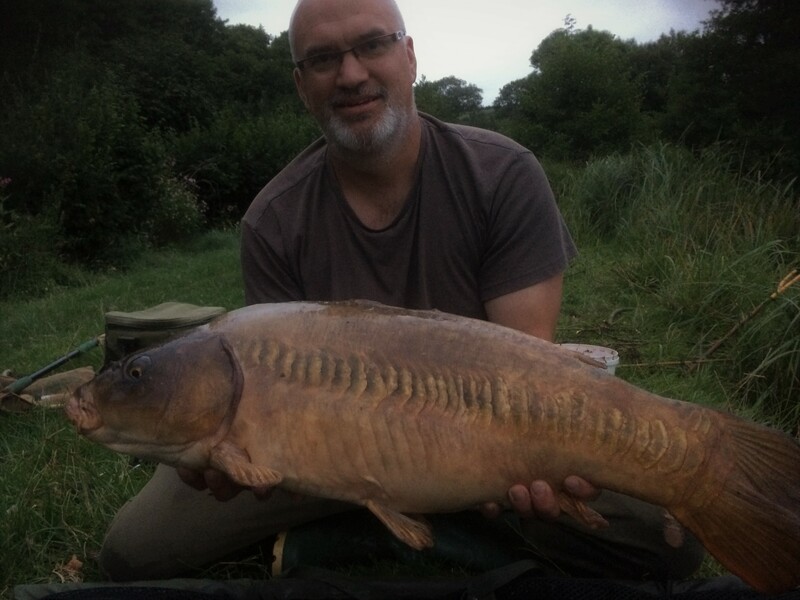 I had 6lb line and this carp was a lumberer not a runner. The only issue would come when trying to lift it through the water – and then squeeze it into the net. It weighed a pound and an ounce less than last year, but 22 and a half pounds of carp left it’s mark once again. Fortunately though, among her countless qualities, my mother is rather good with a needle and thread…..